HP's message to webOS developers - the next chapter? What a difference a year makes! From the beginning, one of the fundamental problems with the Palm acquisition has been the lack of an ecosystem and no significant traction with app developers. It appears that HP is still confused about this critical aspect of building a mobile OS ecosystem, and they are sending mixed messages now that certainly won't make it any better. 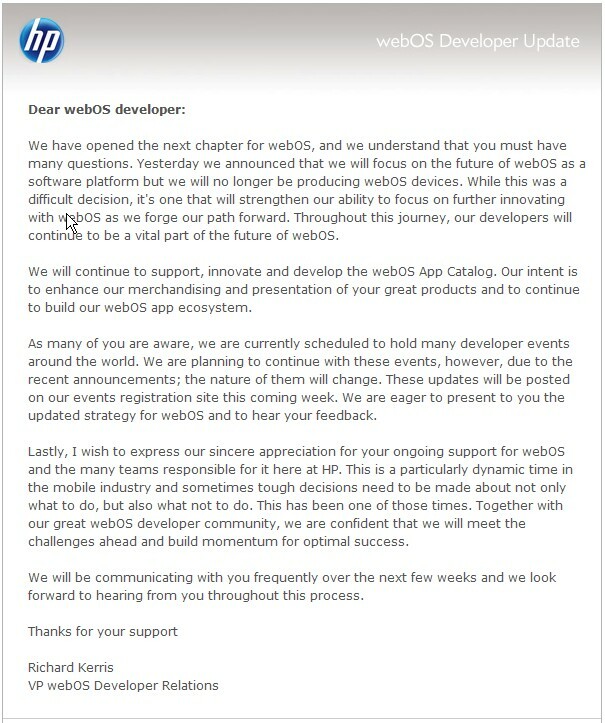 In their press release yesterday HP said they would "continue to explore options" regarding the webOS software, but in the message below - which the company sent to webOS developers today - HP states they will "continue to support, innovate, and develop the webOS App Catalog". OK HP, which is it?